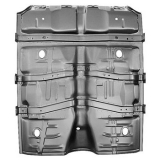 This 64-72 Chevrolet floor pan brace is a must replace item when you are replacing any portion of your floor pan. This brace provides support and rigidity to your floor pan, so it is a good idea to replace your rusted original. This Chevrolet floor brace features the correct contours as well as cage nuts.